This is a post from a few years ago about explaining the Immaculate Conception to kids (and adults) that I am re-posting. Symbolism in this picture includes Mary in the womb of St. Anne (wearing her signature veil). St. Anne and Mary both have their backs turned towards the apple tree to visually state that Mary was conceived without original sin. There are 3 beams of light coming down from the sun that stand for the trinity. Also, the snake (Satan) is unhappy about what has happened here. On Dec. 8, Catholics around the world celebrate another beautiful feast day, the Feast Day of the Immaculate Conception. What does this mean? Many Catholics and non-Catholics mistakenly think that this day celebrates when Mary miraculously conceived Jesus, however this feast day refers to Mary being conceived without original sin. There are so many great articles and resources to explain this doctrine. One article I found, "Advent- The Immaculate Conception", does a beautiful job on how to explain such a teaching to young children. I include the link to the article for myself to refer back to for my children, but if you have time to read it, I hope you too will be blessed by it in some way. 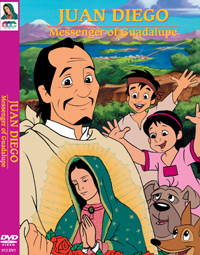 Then on Thursday, Dec. 9, we will celebrate Saint Juan Diego's feast day by watching the CCC video, Juan Diego-Messenger of Guadalupe. See below for a summary from CCC about this video and Juan Diego's true story. I can't say enough good things about CCC and their saints and heroes 11 DVD collection and all their other resources! 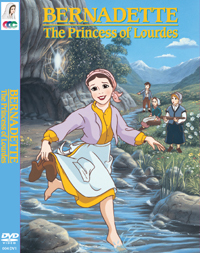 My children watch these DVDs over and over again no matter what feast day it is! WOW thanks so much for this. I really did not know a lot of it! Blessings to your day! I have to find that picture that my boys colored for me a few years ago. It is adorable. Thanks for all the resources! Hi Tracy, I linked back to you in my post today about the Feast of the Immaculate Conception. Thanks to you, I was able to learn about this great DVD and find it at a nearby library. My first graders enjoyed it very much. Advent blessings to you! Congrats, dear Tracy! God bless the babe in your womb! !